Ever wonder where the Great Egyptian Pyramids came from? Or why there are so many triangles in business logos, on American currency and in the music industry? Have you ever heard of The Illuminati? How much do you know about The Freemasons? Have you ever heard of The Jesuits? I hadn’t. Do you know who runs this world? The Prince of The Air on top of course…and the Vatican… Not everything is what it seems in this world. Did you know that there’s just as much acting on CNN, FOX, MSNBC, and all mainstream/government controlled news media? All the world really is a stage. Google Albert Pike. World War 3 is coming. These wicked people have had this planned for a super long time. A New World Order. Thing is, it lines up with The Word of God, The Holy Bible. For example, check out Revelation chapter 13. We are on the precipice of the final 7 years of Tribulation. All hell is about to break loose upon this earth for 7 years, then Jesus will come back with His Church or Bride (The faithful Christian Believers that were raptured just before this 7 year period began). It’s time for the Church to exit and The Antichrist to be ushered in. The Holy Spirit inside of all the Believers and true Children of God is what’s holding the evil one from being revealed. Once God’s People are taken from the earth, darkness will dominate. You think it’s bad now? Cry out to Jesus TODAY! Watch Out! Bible Prophecy Unfolding! You gotta watch people who “meet with the Pope” cuz there’s a reason they are. National Day of Prayer, Pray for the lost souls and to be accounted worthy to escape the things to come to pass and stand before the Son of Man because it will surely come. Jesus is the ONLY WAY. All hell will SURELY break loose. There is NO STOPPING it. We are watching it all unravel and Bible Prophecy is playing out so clearly! If your religion status is marked “Christian” on your online profiles, accounts and such…Consider the following. Is Christianity your way of life? After all, being a Christian means having a relationship with The Son of God, the only way to God, and really following Him. Is Jesus at the center and focal point of everything in your life? Are you all in? Or do you have one foot in the world and the other in The Church? Would you be okay with adding members of your Church or other Christians as your friends or to your circles on Social Media? Are you in any way ashamed of your Lord Jesus Christ? If Jesus were to show up at your door unexpected without notice, would you have to make any present company leave? Would you have to rush and hide anything? Like beer cans, certain music, DVDs and magazines, maybe close your internet browser or clear your computer history? We have to be READY at ANY MOMENT! Are you on fire for Christ, or are you Lukewarm? Time’s about up for The Church Age down here. 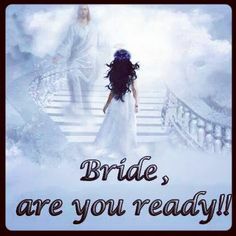 Jesus is about to take his Bride out, or Rapture them, as the 7 year Tribulation is about to begin, where most people will die, and those who choose Jesus will then have to become martyrs for their faith. So I’m asking you, are you ready if the trumpet were to sound and the clouds part TODAY? Jesus is coming for those that are His. The Lukewarm are not all in..
“I know thy works, that thou art neither cold nor hot: I would thou wert cold or hot. So then because thou art lukewarm, and neither cold nor hot, I will spue thee out of my mouth” Revelation 3:15-16. If you believe in Jesus, The Son of God, I urge you strongly to give it all you got! Seek His Face in prayer alone, spending time with Him. It’s getting darker down here! Like I mentioned, it’s a relationship. You will be blessed by this as your relationship grows in faith. The Shield of Faith (as part of the Armor of God in Ephesians chapter 6) quenches the fiery darts of the enemy, like spiritual attacks. Working on building a stronger relationship with Jesus will bless you beyond measure and strengthen you like never before! It’s easy. You’re either living for Jesus or not. We can’t have it both ways, this is not a cafeteria. NOW is the TIME to REMOVE all things in your life that are idols (anything taking God’s place and being put before Him), sinful habits and all else to prepare. Praise God Almighty! He will give you the strength and help you overcome! He takes care of what we cannot. Lay it at His feet. Our Father is so merciful. Let GOD break your chains in the Name of JESUS! Be set free by the power of our LORD and SAVIOR Jesus Christ!!! – The Nation’s First State-Sanctioned Satanic Ceremony Performed At The Michigan Capitol. Signs of the Times…What next? Salvation is free for all. Don’t be left behind for the Tribulation! Jesus’ Return is Imminent! Don’t Be Left Behind! Are you ready to meet Jesus in the clouds? The time is now! Don’t be left behind for 7 years of the Tribulation! It’s all about to go down. The Antichrist is soon to be revealed, war is coming to this nation (America is going to fall. It must for the New World Order/1 world Government to come together), famine, inflation..the big economic collapse mess, death, martyrdom, and the natural disasters we see now are going to be amplified to never before seen apocalyptic levels, the water is going to be unfit for drinking/poisoned, there will be darkness and demons inflicting pain/death, sores and so on. Choose Jesus! Repent, be baptized in the name of the Father, the Son and the Holy Ghost now! We’re going to a place where we are loved beyond measure with joy unspeakable. No more tears. No more will the people of this world tell us we’re not good enough or pretty enough. We will be changed in the blink of an eye. Our new bodies incorruptible and perfect. Immortal in Paradise. Scars are gone. No more eating disorders or mental illnesses. No more disease.The paralyzed and amputees will walk and run. Living in perfect peace. No fear. The deaf will hear the sweetest singing of angels, and the blind will behold the most breathtaking view from Mansions on high. And to be right there with The Almighty, and with our King, Lord Jesus Christ…I cannot imagine how great the comfort and relief. Things are really shaking and quaking around the world. The final pieces of the last days puzzle are being put into place. Our Earth is about to endure a 7 year Tribulation. Hell on earth. People are protesting so strongly in Baltimore right now. I believe that the Baltimore riots taking place and those now happening in other cities are linked to all of the military activity in this Jade Helm 15 thing. If you haven’t heard, I suggest you look it up. Riots busting out right now nationwide + the Jade Helm/military events going on = no coincidence. A lot of us have been watching what’s going on behind the scenes. It’s about to get pretty crazy. Martial Law…? So many people are oblivious to the reality that we live in today. This is far from the America I grew up in and knew as a child, and I’m 30 years old! While the majority of the common people in the world sleep, the powers that be are wide awake. Now is the time to prepare for the future. Hopefully you will consider Jesus right now if you have not done so already. It can save your life…eternally.